The Perfect Layout plug-in includes a complex algorithm for creating a non-colliding and visually balanced look of the staff systems. This algorithm is currently only applied to the score (not to the parts). But if the score actually is a part (i.e. a single staff), then it will also be applied, but in a less sophisticated way (full page span and non-collision only, but not fully visually balanced). Porting this function to the parts will be a major task for future updates. The algorithm works on overstuffed pages as well as on pages with lots of free space. 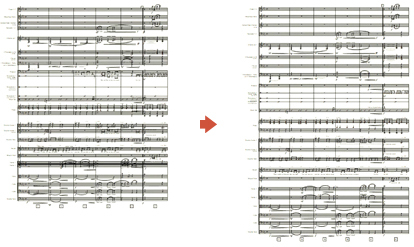 The plug-in starts by creating the maximum condensed score and then inserts space for a good visual balance. If there is way too much space, it won't stretch the page until the bottom page margin, but keep a portion free at the bottom of the page. In general you should always get good results with the default score balancing settings of the plug-in. Should you not be happy with the result or would like to have access to more spacing parameters which are currently hidden to the user, please contact our support team: we might fine-tune our default settings for the future. Usually you will not get this distance between two staves as probably your page will not have that much space. But in case that there is so much space it will be limited to 470 EVPUs, unless only "a bit more" is required to fill the full page. If there is for example a piano part on the staff system, it should not have a distance of 470 EVPU as the other single staves. Instead they should be aligned a bit tighter. 280 EVPU has proved to be a good value for typical piano or harp staves. c.) Multiple systems on a page are automatically spaced too. The extra space that is added between staves and/or systems can be controlled via the "Staff/System Distance" slider. The more you move the slider to the right the more space is inserted between staff systems. d.)The extra space for groups within a system is controlled via the "Extra Distance Before/After Staff Groups" slider. The more you move the slider to the right the more extra space is inserted before and after groups. By default these sliders are set to auto-detection: an algorithm automatically sets good default spacing values for standard score types like single staff, piano, piano + solo, duo, piano + duo, small ensemble or large ensemble. After the score balancing algorithm the bottom system margin will be reduced by this value to allow easy manual shifting of the systems if still necessary. Note: The whole algorithm is a very complex system which takes into account many parameters for a good visual balance, so we found these sliders to be a good and easy-to-use compromise. You can select different alignment techniques for the bottom of the page. In this case alignment means "snap an element to the bottom page margin". That is also why it is important to set the bottom page margin to your needs before running the Perfect Layout plug-in. The option "Fix Staff System Bottom Margin (Auto-Detect Lowest)" looks at all score pages, finds the lowest element at the bottom staff and uses the distance of this element to the bottom staff line as the "fix bottom margin". This guarantees that all staff lines of the bottom staff system align over all pages and that no element goes below the bottom page margin line. This default option works best in most cases. If the bottom staff has very different distances to the bottom staff line (e.g. in modern piano works), it may work better to select the "Lowest Element On Bottom Staff" algorithm which aligns the lowest elements on all pages (and not the bottom staff line). Both options are combined in the default option "Auto-Detect (Fix Staff System Bottom Margin or Lowest Element)": if the bottom margin is huge and very different on each page (e.g. contemporary piano scores), the "Lowest Element" algorithm is select, otherwise the "Fix Staff System Bottom Margin (Auto-Detect Lowest)". "Fix Staff System Bottom Margin": same as above, but the distance is not auto-detected and can be entered manually. "Bottom Staff Line": this option aligns the bottom staff line with the bottom page margin which means that all elements below the bottom staff line appear below the bottom page margin. It's the same as a "Fix Staff System Bottom Margin" with a value of 0 EVPU. Note: the score balancing algorithm needs to take into account each Finale object (except page texts). Unfortunately JW Lua doesn't support all object properties yet, so the algorithm has some minor restrictions. Currently unsupported or only partially supported objects are for example measure text objexts, graphic objects, chord suffix heights, mid-measure clefs, glissando lines, enclosed objects, staff names, lyrics baselines, complex cross staff notes, shape articulations, ledger lines, modified ties and smartshapes that span more then two systems. To still support some of these objects dummy values are used which already lead to better results. The coda system is automatically shifted down for better readability (Option: "Shift Coda System Down"). The algorithm looks for repeat elements or text expressions with the user-defined keyword ("Coda" by default). If the algorithm detects this word at the beginning of a system, it will move the system down by the given value (120 EVPUs by default). If there is not enough space on the page, the score balancing algorithm will probably decrease the distance.